TS PGECET 2018 Notification, Exam dates, Eligibility | Telangana PGECET 2018 Apply online at pgecet.tsche.ac.in , TS Postgraduate Engineering CET 2018 Notification,Schedule, Exam dates, Eligibility Telangana State Postgraduate Engineering Common Entrance Test (PGECET) Notification would be released in the month of March 2018. 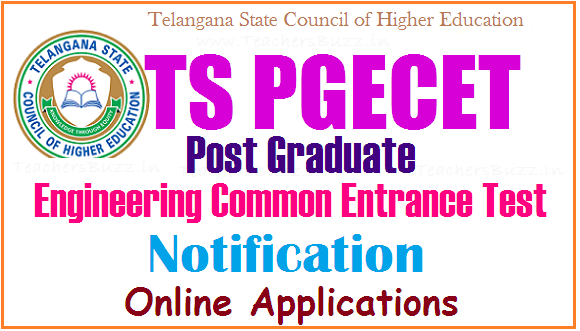 TS PGECET is the Post Graduate Engineering Common Entrance Test of Telangana state.TS PGECET is a State level common entrance test is conducted by the Osmania University on behalf of Telangana State Council of Higher Education (TSCHE). TS PGECET is organized for admission to the first year postgraduate courses in engineering, technology, architecture, pharmacy and planning. It is the state level entrance examination. TS PGECET entrance examinations would be held on 28.05.2018 to 31.05.2018 TS PGECET 2018 Notification, Exam date, Online Application Form, Exam Schedule, Fee, Important dates, Registration,how to apply,Eligibility, Selection process, Qualifying marks,Test centers, admit cards/hall tickets, Results, rank cards, counselling,certificates verification web options, seat allotments, and more details information is given here. Applications are invited for appearing for Post-graduate Engineering Common Entrance Test (#TS #PGECET 2018) for admission into M.E / M.Tech. / M.Pharm. / M. Arch. / Graduate level Pharm. D (P.B.) (Full Time) in University and Affiliated Engineering, Pharmacy and Architecture Colleges in Telangana state for the academic year 2018-2018 as per G.O.Ms.No.54 HE Dept (EC-2) dated: 21-06-2007 and amendments. Qualified candidates would be given admissions into M.Tech, ME, M.Arch and M.Pharm courses offered by the colleges in Telangana State. Note:1. The vacant seats after admitting GATE/GPAT qualified candidates will be filled with the candidates based on the Rank/percentile score secured in the TS PGECET- 2018 Entrance Test. 2. Separate notification will be issued for registration of GATE/GPAT Qualified candidates. 1. The candidate must be the Indian national and must hold the domicile certificate of Andhra Pradesh. 2.The local/non-local status of the candidates should be fulfilled as per the requirements of admission. 3. The qualifying examination (B.E./B.Tech) should be completed with 50% marks (45% for the candidates belonging to SC/ST) in all subjects when put together. 4. Candidates who are appearing / appeared for the qualifying examinations are also eligible to apply for the entrance test. Candidates should be required to produce marks list and pass certificate at the time of admission. 5. Before applying for entrance test the candidate verify the eligibility for various universities to write a particular test and seek admission into the relate course. Eligibility criteria fixed for each course in given official website. 6.The qualifying degree (professional courses) obtained under distance mode must have AICTE / DEC approval. 1. The pattern of the test would be of objective type with multiple choice questions. 2. The candidates should answer 120 questions in two hours. 3. The medium of the question paper will be English. 4. Qualifying cut-off mark in the entrance test is 25% (30 marks out of total 120 marks). 5. The cut-off mark for qualifying is 30 marks for general candidates and for SC/ST candidates there is no minimum marks is prescribed. Eligible candidates who wish to apply for TS PGECET 2018 may submit their applications through online mode only including the payment of registration fee and generation of Hall Tickets. Candidates can visit the websites www.osmania.ac.in, www,tspgecet.org. for submission of online application. The related information regarding eligibility, syllabus, instructions and procedure for online application are available on the website: www.tspgecet.org.